I have previously written about my Morning Routine, which involves daily writing. The routine of sitting down in front of a blank screen, or with a blank piece of paper in a journal, is something I am appreciating more each day. Even if all I do is sporadically write about all of the 500 items I have to accomplish today, it is a great way to get my brain firing with all cylinders! Sometimes, I even find answers to unanswered questions. On the rare occasion I am unable to write as long as I would like in the morning (which can happen when I oversleep or fail to adequately prepare myself by skipping my evening routine), I have set my reminder email from iDoneThis for early in the evening. Then, once I get kids settled in for the evening, and I'm going to set up my MITs for the next day, there is that reminder asking me what I have done. I can even record my accomplishments by simply replying to the email! How easy is that? I also love that within the email, they let you know what you wrote about the last time "they heard from you." Some of these can be great to read because they remind me of past events that may still be important in the present. 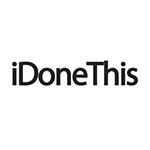 If you haven't tried iDoneThis, you should check it out. It's free or $5/month for the premium version. Personally, since it's only for my own record of events and summaries, I have not needed anything more than the free version. That could change, though, since I can envision how this could be a great tool in keeping my team communicating daily. Maybe next year I will be able to tell you more about how it works as a team tool! What are some items you would include in your daily summary?